If I ever have a baby, and I hope I will soon, somebody please buy this for him/her! 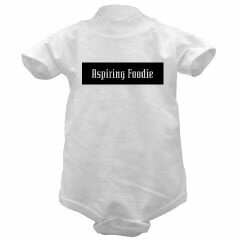 (In case you can’t read it, it says “Aspiring Foodie” on the front.) Florence Fabricant wrote about it in the Times today, and I smiled just looking at it. Next PostLook What the Postman Just Brought!